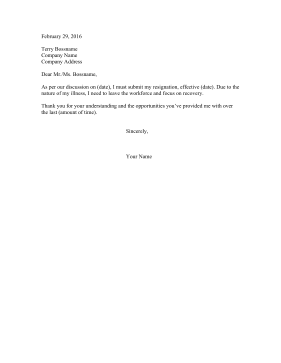 When recovering from a long illness, use this printable resignation letter to take time from work and recover health. As per our discussion on (date), I must submit my resignation, effective (date). Due to the nature of my illness, I need to leave the workforce and focus on recovery. Thank you for your understanding and the opportunities you've provided me with over the last (amount of time).